Numerous users were disappointed in the companies formula change and preferred the old formula over the new one. In previous years Ayush Herbs Ashwagandha was rated one of the best ashwagandha supplements on the market due to being one of the first to offer a simple ingredient formula and having USDA organic certifications. However, recently they’ve changed their formula making it lower in quality but still keeping an effective formula. Most users were not pleased with this change and preferred the better quality. Nonetheless, for those who want an effectively dosed ashwagandha product at a reasonable price, Ayush Herbs Ashwagandha is worth a try. One serving of Ayush Herbs Ashwagandha recorded 500 mg of ashwagandha root extract containing 25 mg of withanolides (5%). Overall, Ayush Herbs Ashwagandha is an okay supplement that does bring an effective formula to the market. Its ingredient formula changed since we first reviewed this product, lowering its quality and ingredient ratings. The brand has been around for quite some time and does produce products not often made by other brands. Contains several ingredients that we deemed to low quality and unnecessary in most cases. These ingredients may cause distress in some users. Only ashwagandha as its active ingredient. Current studies on ashwagandha show that a product containing extract should contain at least 1.5% withanolides for maximum potential benefits. Per serving this product does fall within the recommend dosage for full potential benefits, containing 25 mg of withanolides a 5% concentration. One serving of this product recorded 500 mg of ashwagandha containing 25 mg of withanolides, a 5% concentration. Does contain Magnesium Stearate and caramel color which can cause issues in some users potentially lowering effectiveness. 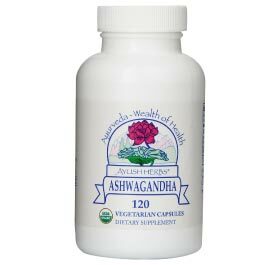 Ayush Herbs Ashwagandha has gone through some changes over the last year or so, changing the formula to a somewhat lower quality when compared to its older formula and when compared to other higher rated products we reviewed. Contains ingredients that we deemed unhealthy thus this products overall quality rating suffered.